GA²LEN is honoured to be holding yet another EAACI Sister Symposium this year in Munich. On Tuesday, 29.05.2018 - 13:30 - 15:00, GA²LEN will hold it's Symposium focussing on The POLLAR Project, The CURE Project, the EUFOREA Project and the GA²LEN Chamber Project. Please do make sure to join us as entrance is free to all. This evidence and consensus-based guideline was developed following the methods recommended by Cochrane and the Grading of Recommendations Assessment, Development and Evaluation (GRADE) working group. The conference was held on December 1st, 2016. It is a joint initiative of the Dermatology Section of the European Academy of Allergology and Clinical Immunology (EAACI), the EU-founded network of excellence, the Global Allergy and Asthma European Network (GA²LEN), the European Dermatology Forum (EDF), and the World Allergy Organization (WAO) with the participation of 48 delegates of 42 national and international societies. This guideline was acknowledged and accepted by the European Union of Medical Specialists (UEMS). Urticaria is a frequent, mast cell-driven disease, presenting with wheals, angioedema, or both. The lifetime prevalence for acute urticaria is approximately 20%. Chronic spontaneous urticaria and other chronic forms of urticaria are disabling, impair quality of life, and affect performance at work and school. This guideline covers the definition and classification of urticaria, taking into account the recent progress in identifying its causes, eliciting factors and pathomechanisms. In addition, it outlines evidence-based diagnostic and therapeutic approaches for the different subtypes of urticaria. GA²LEN wishes all its Partners and Collaboration Centres throughout the whole network a very Merry Christmas and a successful and fruitful 2017. We would like to thank all our members for their valuable support with collaborations, successful allergy schools, studies and research projects and look forward to continuing this great collaborative spirit in 2017. 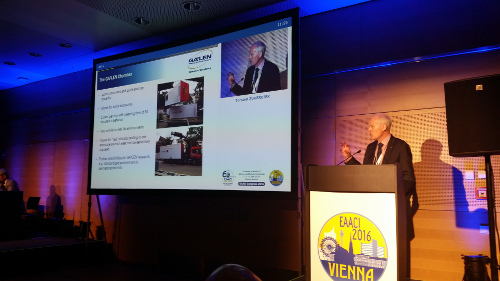 GA²LEN was again highly present this year at EAACI 2016 in Vienna. The GA²LEN Sister Symposium entitled "GA²LEN Research improves precision medicine" was highly attended and explained the 4P's of precison medicine. Nikos Papadopoulos introduced the symposium by asking what are the steps ahead for precision medicine. The 4 P's; Prediction, Prevention, Personalization and Participation talks were given by GA²LEN Network Partner members Prof. Claudio Rhyner, Prof. Jean Bousquet, Prof. Walter Canonica and Prof. Torsten Zuberbier. GA²LEN Participation highlighted the GA²LEN Network and the benefits of participation, including the GA²LEN Chamber. “Urticaria under control” is what this year’s Urticaria Day is all about! On October 1st, GA²LEN helps to celebrate the second World Urticaria Day. Go and check out the Urticaria Day 2015 website and help to increase awareness and knowledge on chronic urticaria! Urticaria day is a great opportunity to raise awareness for urticaria among patients and their families, doctors, politicians, the press and the world. This Guideline is the result of a systematic literature review using the ‘Grading of Recommendations Assessment, Development and Evaluation’ (GRADE) methodology and a structured consensus conference held on 28 and 29 November 2012, in Berlin. It is a joint initiative of the Dermatology Section of the European Academy of Allergy and Clinical Immunology (EAACI), the EU-funded network of excellence, the Global Allergy and Asthma European Network (GA2LEN), the European Dermatology Forum (EDF), and the World Allergy Organization (WAO) with the participation of delegates of 21 national and international societies. Urticaria is a frequent, mast cell-driven disease, presenting with wheals, angioedema, or both. The life-time prevalence for acute urticaria is approximately 20%. Chronic spontaneous urticaria and other chronic forms of urticaria do not only cause a decrease in quality of life, but also affect performance at work and school and, as such, are members of the group of severe allergic diseases. This guideline covers the definition and classification of urticaria, taking into account the recent progress in identifying its causes, eliciting factors and pathomechanisms. In addition, it outlines evidence-based diagnostic and therapeutic approaches for the different subtypes of urticaria. This guideline was acknowledged and accepted by the European Union of Medical Specialists (UEMS). The Methods report describes the process of guideline development in detail. It is the result of a systematic literature review using the ‘Grading of Recommendations Assessment, Development and Evaluation’ (GRADE) methodology and a structured consensus conference held on 28 and 29 November 2012, in Berlin. WINNER: Håvard Ove Skjerven - Håvard graduated as M.D. from the University of Oslo in 2004. Since 2007 he has combined clinical work, student teaching and research within the GA²LEN member Oslo Research group of Asthma and Allergy in Children, the Lung and Environment (ORAACLE). In the last 3 years, he has held the position of assistant Professor. Håvards main research project is the Bronchiolitis ALL-SE Study, a RCT comparing treatment medication (inhaled racemic adrenaline versus inhaled saline) and strategies (on demand versus fixed schedule treatment) in acute bronchiolitis in infants. The RCT included 404 children from 8 different hospitals, and is newly accepted for publication. The projects further main research questions he is working with are 1) viral epidemiology, and the association with 2)disease severity and 3)treatment effect. Further the association between allergic/atopic disease 18 months after bronchiolitis and 4)disease severity, 5)viral epidemiology and 6)treatment efficacy, all recorded during hospitalization less than 12 months of age. Håvard states that the importance of being a part of this GA²LEN group has been, and will be, invaluable for the projects progress. WINNER: Vanessa Garcia Larsen - Vanessa Garcia Larsen is a Post-Doctoral Research Associate at Imperial College London where she is actively engaged in the activities related to the GA²LEN Work Package 2.1. Epidemiological and Clinical Studies chaired by Professor Peter Burney. Her contribution to GA²LEN centres on the study of the role of dietary exposures on outcomes of asthma and allergy. Vanessa was responsible for the development and subsequent use of the GA²LEN Food Frequency Questionnaire (FFQ), which allowed tehem to collect standardised information on dietary intake in a sample of 3,100 adults. Vanessa is currently working on the analyses of this investigation. In 2012 Vanessa was the main supervisor of an MSc project at Imperial College London, where she investigated the association between dietary intake of fresh fruits and vegetables in relation to asthma in the GA²LEN study population. An abstract with these results was selected for an oral presentation in the EAACI Congress. This proved to be an excellent opportunity to disseminate the continuous work carried out within GA²LEN. Vanessa believe the impact of the nutritional component of the GA²LEN Follow-up Survey will continue to increase as we disseminate the findings. There are currently two manuscripts under preparation. The methodological paper on the validation of the GA2LEN FFQ was published in 2011. This has provided the foundation for the use of the FFQ in at least 4 large international studies investigating the role of diet on lung-related and other chronic diseases. As a nutritional epidemiologist, Vanessa has a strong interest in providing scientific evidence on the role of diet on allergic diseases. Vanessa says that this Travel Grant would allowed her to strenghten the links with other researchers within the GA²LEN Network as well as with our partners in EAACI. Given the international nature of this Congress and its relevance in the field of asthma and allergic diseases, her attendance gave her a unique opportunity to highlight the ongoing work that her Partner instituition is doing within GA²LEN. Vanessa states that her attendance at EAACI also allowed her to take an active role in the GA²LEN General Assembly meeting, to which she was invited in 2012 to present the rationale and initial results of the GA²LEN Diet Study. WINNER and best oral presentation award winner: Francisco de Borja Callejas Díaz. Borja is involved in the current GA²LEN projects including translational research in the GA²LEN rhinosinusitis project(former WP 2.7.2). He gave an oral presentation on part of this work and presented in Milan. Borja is also working on the SPT Follow-up study. He has been involved in database collection and processing. Borja Callejas has a Junior predoctoral position at GA²LEN Partner institution IDIBAPS, Spain. He really hoped that he would be considered for a GA²LEN Travel Grant and we were delighted to make this possible. Borja attended the 2013 EAACI Congress in Milan (Italy). He was awarded the prize for the best oral presentation in the section Markers of chronic rhinosinusitis. His presentation was entitled “Characterization of two epithelial cell air-liquid interface (ALI) culture models for human healthy nasal mucosa and nasal polyps”. Congratulations and excellent work Borja! For a further article on Borjas work visit the IDIBAPS website. "Healthy Ageing across the Lifecycle"
This high level meeting in Cyprus was held at the 'FILOXENIA' Conference Centre in Lefkosia (Nicosia) 05. - 06. September 2012. 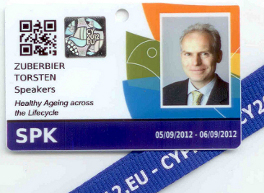 There was a special focus on the prevention of non-communicable diseases, as well as on health promotion from early childhood, as a prerequisite and integral part of a healthy ageing process across the lifecycle, bearing in mind that 2012 is the European Year of Active and Healthy Ageing. GA²LEN Secretary General, Prof. Torsten Zuberbier gave a presentation entitled “Network in allergy - A surveillance network to improve active and healthy ageing”. The priorities of the Ministry of Health are health from early childhood, as a prerequisite and integral part of a healthy ageing process. The need for being proactive with the ageing population and present economic crisis being a burden on health systems, and furthermore a need for implementing effective disease prevention and health promotion programs across the lifecycle. As you can see from the Conference Family Photo below, the conference was successful and highlighted the importance of Active and Healthy Ageing. GA²LEN was present this year at the EAACI 2012 congress in Geneva. We were delighted to welcome to the stand Nikos Papadopoulos, EAACI Secretary General and Cezmi Akdis, EAACI President and member of GA²LEN, on their walk-around at the National Society Village in the exhibitors hall. 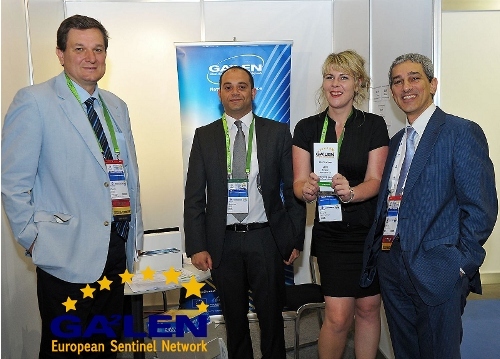 GA²LEN was promoting its Sentinel Network Call to Action, collecting signatures of support from EAACI delegates and GA²LEN friends who were attending. We were pleased to see Prof. Peter Burney, Prof. Torsten Zuberbier, Prof. Ewa Nizankowska-Mogilnicka, Prof. Carsten Bindslev-Jensen, Prof. Magnus Wickman, Professor Tari Haahtela, Prof. Bolesław Samoliński, Prof. Jean Bousquet and Dr Vanessa Garcia Larsen, who has been busy with new updates on the GA²LEN FFQ, more to follow on this so watch this space. Council of the European Union conclusions on chronic respiratory diseases in children Asthma, allergic rhinitis, and other chronic respiratory diseases are the most common non-communicable diseases in children, and their prevalence and burden have increased in recent decades. This is why the Polish Presidency of the Council of the European Union (EU) has made their prevention, early diagnosis, and treatment a priority for the EU's public health policy. On Sept 20—21, 2011, the Polish Presidency held an expert's conference to prepare the conclusions of the Council. These conclusions were adopted during an interministerial conference of the 27 Member States, on Dec 2, 2011. Berlin, 27 February 2012 – On 27 and 28 February, leading up to “Rare Disease Day”, the annual GA²LEN conference takes place at the Charité Universitätsmedizin (university hospital) Berlin. GA²LEN stands for Global Allergy and Asthma European Network and is a network of European specialty centres that works to strengthen European research on allergies and asthma. This year’s conference focuses on the current situation in the development and implementation of clinical studies on rare allergies in particular, as well as possibilities for improvement in this area. “In the study of allergies, we find many rare sub-forms of allergies as well as rare allergens”, says Prof. Dr. med. Dr. h. c. Torsten Zuberbier, Secretary General of GA²LEN. “Because they are so rare, gathering information on these allergies through medical studies can be very challenging. The available treatment options often do not adequately address these small groups”, continues Zuberbier. “The conference is intended to bring us a significant step further in the development of relevant clinical studies. We want to make progress in the treatment of rare allergies.” One emphasis of the conference will be the development of an improved definition of outcome parameters for clinical studies. The parameters should also be able to take into account individual results from allergy sub-phenotypes. Leading experts from research and academics, representatives of the EMA (European Medicines Agency), patient organisations and industry representatives will discuss openly the possibilities for improvement in clinical studies. The international guest speakers include Prof. Guido Rasi, Executive Director of the European Medicines Agency (EMA); Lars Jacobsen, European Allergen Manufacturers Group (EMG); Prof. Sergio Bonini, CNR Rome; Prof. Bruce Zuraw, University of San Diego; Dr. Anna Simon, Raboud University Nijmegen Medical Centre. Make sure you don't miss this great opportunity to be a part of the GA²LEN Annual Conference 2012. The topic will be "Clinical Trials - the current situation and future chances in the limelight". Please visit the conference programme page for a more detailed programme. Speakers and experts will come from right across Europe including Professor Guido Rasi Executive Director of the EMA and Professor Bruce Zuraw from the University of California, San Diego. GA²LEN is delighted to have distinguished conference support from Professor Sergio Bonini as the Head of our Conference Organising Committee and Professor Jean Bousquet, GA²LEN Vice President, WHO and GARD member to discuss and chair sessions, as well as the chance to discuss with the many leading GA²LEN experts from across Europe including; Prof. Kai-Håkon Carlsen, Prof. Boleslaw Samolinski, Prof. Karin C. Lødrup Carlsen, Prof. Peter Burney, Prof. Marcus Maurer and many, many more. GA²LEN Partner, Prof. Carsten Bindslev-Jensen from Odense Denmark, has been quoted in an article from "Der Spiegel" today regarding his outstanding research and "Detective work" that resulted in the discovery of an allergic reaction to a modified wheat protein. Commenting on how he and his team found out about the mystery wheat allergy, Prof. Bindlev-Jensen said "It was real detective work and it kept us busy for weeks!". The article goes in-depth on the subject of how manufacturers use "clean labeling" and how a modified wheat protein cansometimes be simply labeled as wheat. At GA²LENs European Parliament Lunch Debate, we were honored to have speeches made by our hosting MEP Christofer Fjellner who spoke of the timely manner in which GA²LEN has presented itself, as only 10% of allergy and asthma patients are being properly treated. MEP Mr. Fjellner also stated that GA²LEN would help to control the mounting costs to employers, mainly due to reduced presenteeism with untreated allergies, which are now totaling €100 Billion Euros. MEP Dr. Ioannis Kasoulides gave a supporting speech stating that GA²LEN can respond to the challenges faced by today's European Citizens in the light of such chronic diseases and their perpetual increase. A supportive closing speech was made on behalf of MEP Sirpa Pietikäinen. Prof. Torsten Zuberbier, GA²LEN Secretary General presented the background information of GA²LEN, its members, groundbreaking work and the proposal of the Sentinel Network. Breda Flood, the President of the European Federation of Allergy and Airways Diseases Patients Association explained the importance of the patients view, a right to quality of life with allergies and asthma and gave support and endorsement for the Call to Action of the GA²LEN sentinel network. Prof. Boleslaw Samolinski, member of the subcommittee of the Polish Health Presidency and Ms. Agnieszka Czupryniak, Polish Ministry of Health spoke of the importance of the GA²LEN Sentinel Network in conjunction with the Polish Health priorities during the Polish EU Presidency. The Polish Presidency invites the Commission and Member States to encourage and support research in prevention, early detection, treatment and causative factors and supports the creation of networks, preferably employing already existing infrastructures. Ms. Natacha Grenier from the European Commission, DG Sanco explained the importance of air quality and treatment of COPD. Health inequalities must also be addresses and GA²LEN can help to address this imbalance. A further inspiring talk came from Prof. Jean Bousquet, from the University of Montpellier and WHO Collaborating Centre on asthma and rhinitis, who stressed the need for early prevention and detection and stated that the infrastructure is in place and is cost effective to address allergies and asthma. On many occasions, President Professor Jerzy Buzek has stressed that Parliament is committed to supporting better care and treatments for asthma, allergies and COPD. We would now like to ask you, after our successful start for your continuing support in the coming months to make the GA²LEN “Call to Action” fruitful and ultimately, through using GA²LENs unique expertise and network of researchers, be able to offer a better quality of life for allergy and asthma patients throughout Europe. GA²LEN (Global Allergy and Asthma European Network) and EAACI (European Academy of Allergy and Clinical Immunology) support the current call for simplification as the current EU regulations on Clinical trials slow down and hinder not only allergen immunotherapy, but also allergen diagnostics. The European Clinical Trials Directive 2001/20/EC (EUCTD) was introduced to establish standardisation of research activity in clinical trials throughout the European Community. GA²LENs Secretary General, Professor Torsten Zuberbier stated that "The current EU Regulations are surely meant as improvement but are based on standard disease scenarios. With complex diseases such as allergy and allergen immunotherapy, trials cannot be "Pigeon-holed" as each case of allergic disease is as varied and individual as the patient themselves". Even more difficult is the situation in diagnostics for skin testing (e.g. patch test for contact allergy, prick test for hayfever or food allergy), which now also need to undergo trials for licensing. With thousands of different possible allergens this is virtually impossible. A novel central EMA approach for allergy skin test diagnostics is therefore urgently needed and employing the GA²LEN structure of a Pan European network might be ideal for a standardized assessment of the quality. GA²LEN already has taken the first steps by inviting all stakeholders to a conference on improvement of clinical trials in allergy 27-28 February, 2012. Nikos Papadopoulos, EAACIs Secretary General adds "Allergies place a major burden on the quality of life of Europeans. Patients and doctors alike, are calling for better treatments, and this is only going to happen if we streamline the research process". GA²LEN, the Global Allergy and Asthma European Network, is a consortium of leading European research centres specialized in allergic diseases, which include asthma. GA²LEN addresses the growing public health concern of allergic diseases, with its objectives to enhance the quality and relevance of research and to address all aspects of the disease, create a permanent and durable structure that will maximize the scientific contribution of Europe to this area, accelerate the application of research results to clinical practice, patients' needs and policy development, to promote training and integration between the public and private sector and to eventually decrease the social and economic burden of allergy and asthma throughout Europe. EAACI is an association of clinicians, researchers and allied health professionals, dedicated to improving the health of people affected by allergic diseases. With over 6,800 individual members and 41 European National Societies, EAACI is a source of expertise in Europe for all aspects of allergy. GA²LEN will be present in the European Parliament on 19th October for a debate with MEPS to support its Call for Action of an Allergy Surveillance and Sentinel Network for Europe. For the first time the GA²LEN network has brought together epidemiological, basic and clinical researchers from across the European Union (EU) to work on common projects. Results have been published widely, with more than 100 scientific papers documenting multidisciplinary collaboration on a large scale. GA²LEN has allowed for allergic diseases and asthma to be tackled in a global approach starting from co-programming and facilitating basic research, accelerating the results for translational research, optimizing multinational clinical research but not stopping there. GA²LEN has systematically created or updated relevant guidelines for all major topics in allergy, together with the EAACI. Research teams were chosen for their scientific excellence, their record on multidisciplinary working and international collaboration, and their educational activities. Since the launch of the Network, it has grown to include an additional 50 collaborating centres making GA²LEN one of the largest multidisciplinary networks of researchers in allergy and asthma worldwide. GA²LEN, the Global Allergy and Asthma European Network, is a consortium of leading European research centres specialized in allergic diseases, which include asthma. Funded by the European Union under the 6th Framework Programme, GA²LEN addresses the growing public health concern of allergic diseases. to enhance the quality and relevance of research and to address all aspects of the disease. to create a permanent and durable structure that will maximize the scientific contribution of Europe to this area. to accelerate the application of research results to clinical practice, patients' needs and policy development. to promote training and integration between the public and private sector. to eventually decrease the social and economic burden of allergy and asthma throughout Europe. GA²LEN is looking for event organisers for its allergy schools and Masterclasses for help with logistics and coordination. If you are interested, please get in touch with the GA²LEN main office.